COCOA BEACH, Florida -- Florida continues to hold its title as the #1 state for shark attacks, according to the International Shark Attack File (ISAF) 2014 Worldwide Shark Attack Summary released last month. With 28 shark attacks recorded in 2014, Florida accounted for over half of all unprovoked attack in the U.S. Florida also had over twice the number of attacks as the entire country of Australia (11 attacks). Once again, the two counties on Florida's east coast that are also popular Spring Break destinations, Volusia County (Daytona Beach) and Brevard County (Cocoa Beach), had the most shark attacks than anywhere else in the Sunshine State. Volusia County recorded 10 attacks in 2014 while Brevard County recorded 8. Other Florida counties having attacks in 2014 were Broward and Palm Beach (2 each), and Duval, Gulf, Martin, Okaloosa, St. Johns, and St. Lucie (1 each). Researchers say that the high number of shark attacks on Central Florida's east coast is attributable to very high aquatic recreational utilization of their attractive beaches and waters by both Florida residents and tourists, especially surfers, and the rich nature of Florida's marine fauna. 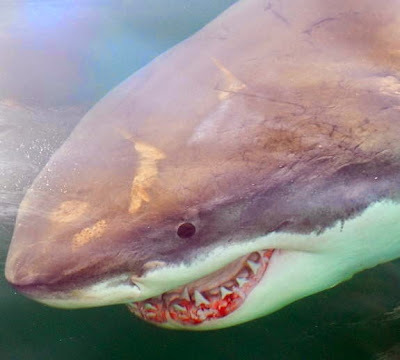 Although Florida had the most shark attacks, those incidents rank low on the Shark-Induced Trauma scale, according to George Burgess, curator of the world shark attack data housed at the University of Florida’s Florida Museum of Natural History. “Most of them are better called bites than attacks. They’re the equivalent of dog bites,” said Burgess. 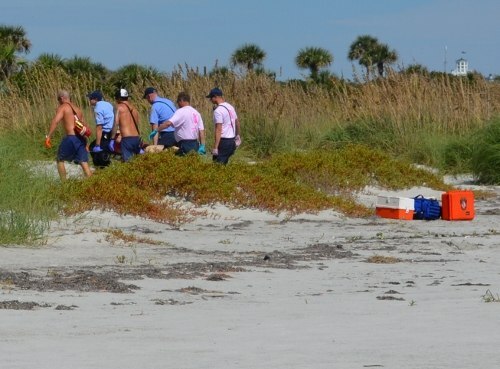 Woman attacked by shark in Brevard County, Florida. Brevard Times / File photo.